But did you know Bryan-College Station belongs on that list, as well? It’s true, but to learn about its origins and heyday, you have to flash back 50 years. In the early 1960s, Bill Watkins decided the radio station he co-owned, WTAW-AM, needed a new sound to freshen things up, and a jingle package would be just the thing. Think of a jingle package as a collection of catchy and memorable moments that mention a station’s call letters and frequency. Bill turned to Dallas-based PAMS that offered the incentive of recording a customized song, called “My Home Town,” about his community and creating a supply of 45 RPM records that could be sold or given away. All Bill had to do was come up with some lyrics. Let me tell you about my hometown — it’s really great! The center of population in the good ol’ Lone Star State. And the deer hunting is better than it was when the Indians were around. In Bryan-College Station…that’s my hometown! As a former news director for WTAW-AM, and as someone who gleefully played this song on the morning show numerous times in the 1990s, the deer-hunting line remains my favorite. In all, Bill and his staff wrote four verses that relied heavily on Aggie traditions and academic prowess, included some clean-cut filler words like “mighty-fine” and “yessiree,” and turned to natural surroundings for additional inspiration. Click here to listen to the entire “Bryan-College Station: That’s My Hometown” song. Bill recalls the community being initially “awestruck” about the song, and that it translated into an increase in sales for the station. But over time, residents began poking fun at the lyrics. Television was supposed to be killing radio, he said, and his staff had to prove themselves every day through innovative means like this one. Meanwhile, Bill said WTAW was committed to covering “every fender bender in the community,” as well as city government and school board meetings, in order to be first with information and stay ahead of his television counterparts. 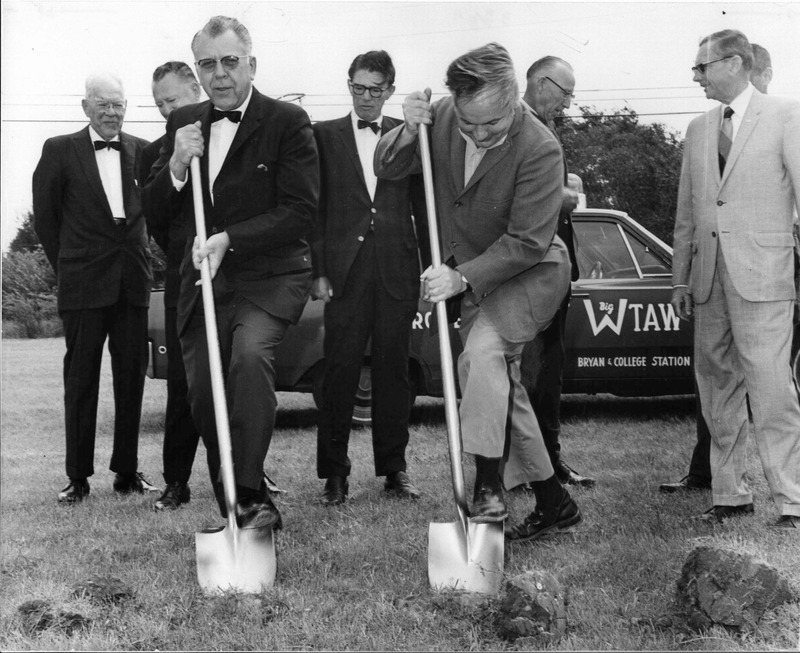 Bill Watkins and John Hicks jointly owned WTAW from 1961 until Watkins bought out his partner in 1980. Six years later, he sold the station to John’s son, Bill, who since has overseen WTAW’s striking growth and success, along with acquiring several additional stations. Bill Watkins and WTAW-AM are certainly part of College Station’s 75 years of history. Incidentally, WTAW turns 91 this year; Bill turns 81. This entry was posted on May 13, 2013 by City of College Station. It was filed under Historic Preservation, Public Communications and was tagged with 75th anniversary, Project HOLD.